Big Guy being Big Guy, he immediately was suspicious of the basketball jersey when it arrived in the mail Friday. Even though he’s begged for one every game of the NBA championship series, even though it’s one exactly like he’s coveted when his frenemy has worn it to school this spring, it’s still a tank top. That automatically made it weird and to be avoided. Ay, but that was before Dad got him on the phone and threatened to take over the Laker jersey when he returns from Army training. “Mine’s too big for me now, you know. I think yours will fit me just fine,” Dad said. Roughly 3.6 seconds after Big Guy got off the phone, he put on the jersey. His head was through the arm holes at first – turns out tank tops are tricky as well as suspect – but he eventually got there. He’s rarely taken it off in the 24 hours since. Just wearing it seems to have upgraded his patio game several notches. He’s not content with layups – he has to slam it. Shooting from the edge of the patio no longer suffices – he has to step into the yard, which he tells me is three-point range. 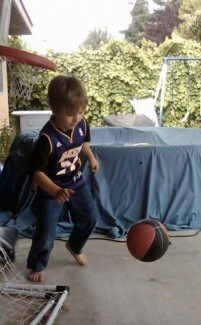 “Will you and Daddy come and see me when I’m playing for the Lakers?” he asked. Poor babes. I don’t have the heart to tell him that if family history is anything to go on, he’ll be lucky to crack 5-8. I should have bought him a Spud Webb jersey. Point guard’s the position for you, young man. But because Dad’s a Laker fan and Big Guy is by extension, a fated-for-under-6-feet-tall 5-year-old is fixated on Kobe Bryant. Occasionally he’ll play Pao Gasol, though Boots would be more appropriately cast in that role. He’s the one around here most likely to be the victim of an unprovoked whack on the back. The once-scorned shirt now has become Most Valued Apparel, to be protected at all costs. That’s not bad progress for a kid who recoiled in horror when first faced with a strange new shirt. Just for Big Guy, I’m rooting for the other team. My team always loses. It’s best for him that I root for the other team! HA! I know the feeling. Remember, I’m a fan of the rapidly collapsing Reds. Big Guy was actually mildly rooting for the other team last night when he figured out that if the Lakers won it would be the end of the season. He was a bit disappointed afteward, too, because there wasn’t enough confetti during the celebration. “They’re in Orlando, babes, and the Magic are kind of sad.” But then he perked up when he saw the trophies – “Those are way bigger than mine!” – and Kobe Bryant’s kids.